So I made a self promise to limit my baking for a bit. I lasted about a week, but I was tempted by an enticing bag of chocolate chips. I swear, for some reason, chocolate chips just disappear in my apartment! I feel like I keep buying chips, but they somehow get eaten before I manage to use them. Anyways, I had about a third of a bag of chocolate chips left, so I wanted to put them to good use, and make chocolate chip cookies that look like actual cookies. As some of you know, I have a bit of a problem with baking cookies. Truth be told, cookies and I have a love/hate relationship: I love to make them & they hate to look like actual cookies. They never flatten out, and instead look like little balls of dough. Not too appetizing at all. So I was on the hunt for a good chocolate chip cookie recipe that would result in something that looked like a legitimate cookie. Question: Has anything similar happened to you? 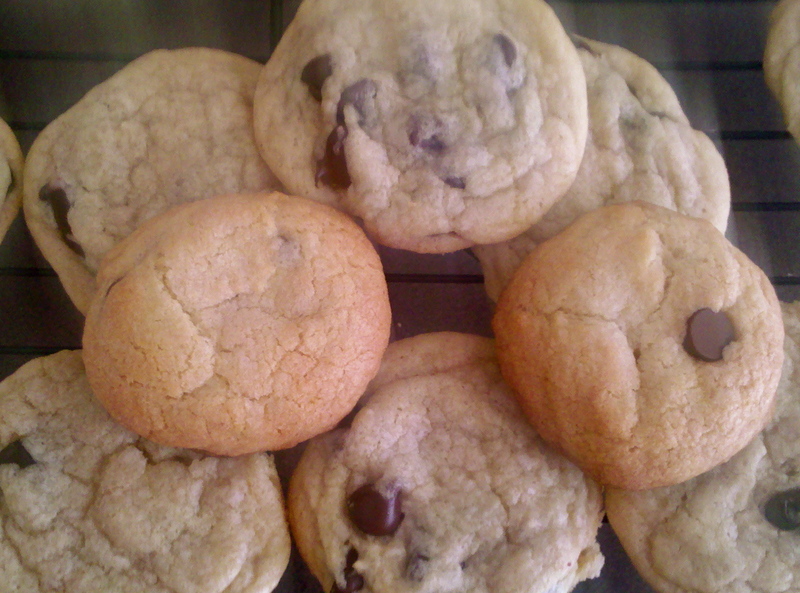 This entry was posted in Desserts and tagged chocolate chip, cookie. Bookmark the permalink. Thanks for sharing the cookies at today’s I-hop meeting! My cooking issue is that I always put the cookies too close together and they become one big cookie!! I don’t think it’s my oven though.. it’s definitely me not separating them enough! I’ve definitely had that happen too… especially when dough is too wet! I’m trying to be better at separating the dough too!